What Type of Dentures in Miami is Right for You? Dentures replace weak or missing teeth. These removable dental appliances come in a variety of forms and may behave as either a full or partial set of teeth in one or multiple areas of your mouth. Traditional full or partial dentures rest naturally on the gums, attached to the natural teeth. Contrarily, the modern All-on-4 system represents implant-supported dentures attached to a foundation that remain surgically affixed to the jawbone. Considering a new set of dentures in Miami? You probably wonder what type of dentures will serve your needs best. Dr. Andres de Cardenas wants to help by offering some information on the different types of dentures in Miami, and the unique benefits they provide. If your mouth is missing just a few teeth, partial dentures can fill in the gap. 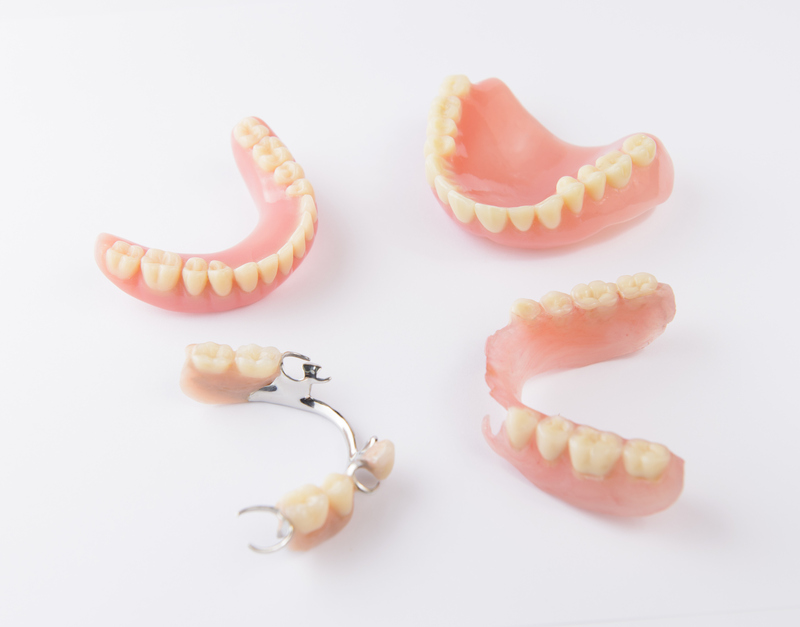 A dentist may attach a partial denture in a variety of ways. The most conventional method utilizes metal clasps that grip the remaining natural teeth. They might also adhere the partial denture using less noticeable, precision attachments. Dentists can additionally attach a partial denture to crowns on natural teeth. The crowns may improve the fit of a partial denture, but require a dental professional to utilize precision attachments as well. Full dentures act as a replacement for your upper and lower teeth. Once a dentist removes your teeth, you must wait for your gums to heal. After the healing process, you will be ready to wear a full denture. This method is the one we most commonly think of when we hear the word dentures. They consist of a row of artificial teeth, commonly affixed to a pink base designed to mimic natural gums. A dentist will create a mold of your mouth that rests the dentures against the gum line. For an ideal fit, dentists may wait for several months before measuring the mouth. Nonetheless, you will remain without your teeth for this time, so a dentist may affix a temporary replacement in the meantime to ensure optimal comfort. All-on-4 dental implants support an entire arch of teeth. However, the equipment can accomplish this by employing only four implants. It is an ideal method for replacing missing teeth on the upper or lower jaw. All-on-4 cultivates an aesthetic that appears similar to your natural teeth, fixed in place for a permanent solution. If you possess some bone loss, All-on-4 mitigates the need for bone grafting. These dentures provide a set of teeth that appear indistinguishable from your real set of natural teeth and takes advantage of dense remaining bone throughout other areas of the jaw. Implant dentistry represents the latest in denture technology. Instead of resting on the gums, implant dentistry measures like All-on-4 connects dentures to titanium posts in the jawbone. As a result, patients experience excellent biting power without worrying about slipping or irritation with All-on-4 dentures in Miami. 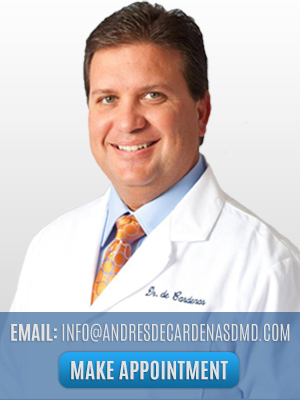 The Miami Cosmetic Dentist Dr. Andres de Cardenas and our dental practice in South Florida focus on making dental procedures as easy and stress-free as possible in a welcoming environment. When you enter our office, you are part of our family. By utilizing the latest technologies and techniques in the dental field, we can help you replace your missing teeth using a wide variety of dentures in Miami. For more information, contact our dedicated and caring team today!